At a small birthday gathering many years ago we celebrated a friend turning 40. Her father had given her a mug covered in writing about the perils of being 40. She picked it up and started to read, suddenly she lengthened her arm, then brought it back in, telescoped back out trying desperately to find the spot where things would come into focus. We then joked mercilessly about how old and decrepit she was. I turned 40 in January, maybe you remember, there was a party and a crown. Before today I hadn't noticed any of the signs of aging in particular. This morning the subway was crowded. I needed to try to be close to on time, though, so on I smushed, determined to read my book to distract myself from the discomfort and the raging, yeasty hatred of humanity. I found myself sardined in so tight that at the level of my eyes the book was crammed no more than two inches from my nose. I could not make sense of the print. It was horrible. Since my glasses are relatively narrow lensed I happened to notice that things were clearer without the specs. I spent one whole stop angling my head unbelievably awkwardly to read the sentences just below my glasses and finally realized I could just take them off. So I propped them atop my head and happily read straight through to midtown. In my mind's eye I looked just like my ex-boyfriend's mother, glasses perched atop suburban hair cut, looking down my nose at a book. Really wasn't ready for that. Oh, and not for nothin', but this is really well written (not that a lot of your other stuff isn't, mind you, but this struck me as being particularly tight and elegant. Nicely done). That's really kind of you to say and very well timed. I hit post, went out to walk the dog and thought, "That was just terrible! Why did you post it right away?!?!?!" Oh yeah. About 5 years ago I realized I need reading glasses. Since I already wear contact lenses, this is a weirdly ironic thing - now I need to wear glasses when I'm wearing my lenses, to read. When I take my lenses out and wear REAL glasses, I have to take my glasses OFF to read, and have to bring the book real close. 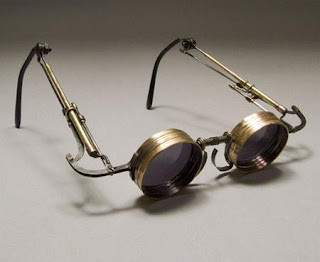 Good gravy marie, where can I get me a pair of those specs? They look like they just fell off the back of a Terry Gilliam movie. Oh, and yes, nicely done. "[R]aging yeasty hatred" is perfection. I google imaged "spectacles" and those were my favorite ones. i agree with mrs chili about your writing, especially "the raging, yeasty hatred of humanity." Nice. Well, not nice, but nice.